Alankar TV is a 24X7 movie channel with full of family centered movies and entertainment programmes. Watch your favorite movies of Odia in high quality via Alankar TV live streaming. 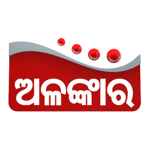 Watch Alankar TV Odia Online.